A devaluation is often a way out of financial trouble for a country. But for many crisis-hit countries in the euro area, devaluation is not an option. ‘Internal’ devaluation—through wage moderation, for instance—is often discussed as an alternative solution for these countries to try to mimic the outcomes of an external devaluation. When does such internal devaluation work? My new IMF paper provides evidence on this using the euro area countries as an illustration. The main finding is that for wage moderation to work when a number of countries are undertaking it at the same time, strong support is needed from monetary policy in the form of quantitative easing. The paper shows that when one crisis-hit euro area country pursues wage moderation, it stands to gain in terms of an increase in its output. 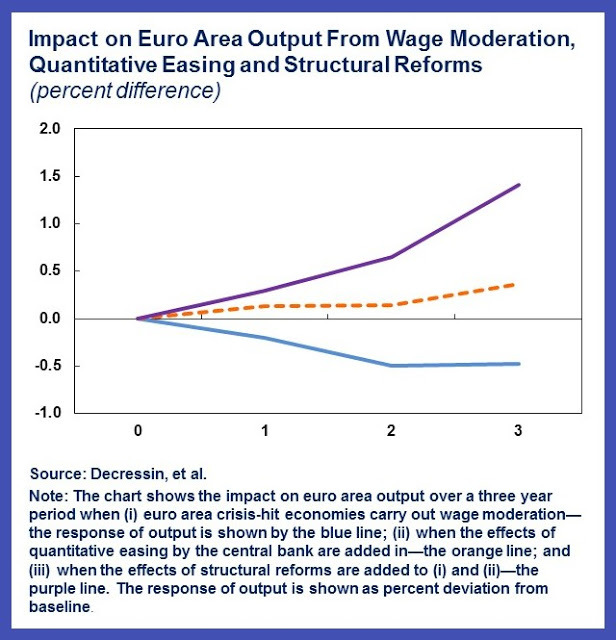 But when a few crisis-hit euro area countries pursue wage moderation at the same time, the benefits to each one decline; moreover, the collective wage moderation by the group has adverse spillovers on the other euro area countries, so that euro area output as a whole declines. Quantitative easing by the central bank can offset the decline in euro area output. Here is a blog that summarizes the paper and here is the paper itself.